is the viticultural Methuselah in the south-west facing valley bottom of Kazaviti. With a splendid sea view and lovely meandered vineyard drywalls, we flirted with with being able to take this gem under our wing for half a decade. 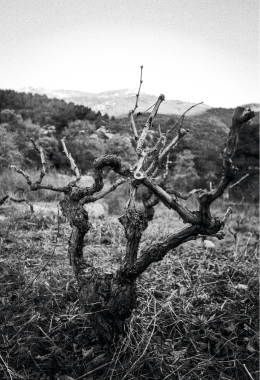 Since January 2016, we have planted 100-year-old autochthonous vines, initiated a reactivation campaign, which on Thasos, is uncomparable up to date. The Ancient Vineyard rescue project was born. It is alleged that the Phoenicians brought the terrace culture to Thasos. If we look at the outgoing zone of the olive groves below Platon’s Vineyard, at 320 metres above sea level, we no longer doubt it. The olive tree species “Throumba” came by early expeditions of the independent Syrian small kingdoms of Phoenicia to Thasos. That means, that these old plants, located below our vineyard which still generate a yearly harvest till today, must be around or over 2000 years old. That much in a nutshell. To understand Thasos, or a developing island settlement in general; considering the aspects of time and space over the course of millennia, one must note that there were always “Golden Years”. Each settler and traveler brought his gifts within the form of crops and old livestock breeds. Sometimes as settlers, sometimes just as a gift to honor their host with the noblest plants of his heritage. Therefore isolated forms of various species, we can still find in our vineyard again today, remain. A highly diverse ancient vineyard. We still have to surrender to the manifold and versatile phenology of different plants in our vineyard nowadays. Hence we also encounter new types of mutations similar to Pinot. The vine population was obtained among others by the restocked vineyards from Mount Athos, Halkidiki in ungrafted condition. 4000 sqm, 1000 ungrafted vines, located on four terraces, since 1875 as such in agricultural use, old forgotten varieties, old forgotten fruit trees, wild oregano, fennel and cysts, bothersome elms and majestic pines, located 2100 kilometres away from the weinserien.-headquarters. The facts conclude that it could not be any more of a challenge for us. We accept this challenge, take it further and invite all those interested to join us on a vinicultural excursion. once again we have developed a new creation. Pinot Noir ’10 Brut nature. From our Pinot Noir, which is known by one or the other as “932 ​​square meters”, we developed an exceptional red sparkling wine, according to our rather unorthodox style in winemaking. Titles are awarded by others, but this sparkling wine definitely promotes a reserve-character. After three years of care and batonnage in a Tonneau we transformed this classic red wine in-house to this expressive sparkling. After a period of sixteen months classic bottle fermentation, we approved our product with german restaurant managers and star gastronomers to the extent that we do not want to add an additional Dosage to the sparkling wine. 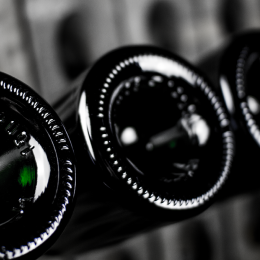 This market-bound step leads us to do the one or other store check before filling or the disgorgement of sparkling wines, to archive the fullest customer satisfaction and to fulfill contemporary wine conaisserus needs. We bring the issue of “le 7ème sens” Magnum edition, currently on our new Riesling, the “field blend” and a Frühburgunder (Pinot Noir Precoce). Expected launch date for this undertaking is January 2017. Slowly, slowly. after many years of experience in vinification with amphorae, established now a way to understand the open mash fermentation of white wine as a consistent statement for such: A vinification on vivid yeast over several months in an ancient amphora and no additional dosage of sulfur cultivated by weinserien. since 2014, as gustatory expertise for two new wines. These are the vines which were planted in Hallgarten / Hargadun in 1978 at an altitude of 270 m above sea level. These once dismissed and frowned upon vineyards, show their full potential today. Precisely because of the climatic changes in the Rheingau harvest dates on these height levels are still possible in late October. 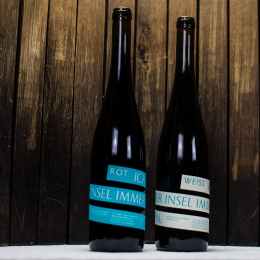 Both a Riesling, as well as the autochthonous vine Portugeus azul retrieved after a six months’ residence in the Thasian Kioupia the unsulphurated natural wines find their way into the bottle. Basically: Fermented grape juice as a result. The movement around the natural wine is not as new as it suggests. In France the experiences with it have thrived and maintained already for decades. For this style in winemaking the highest hygienic conditions in the cellar are mandatory requirements. A niche product that certainly would not be suitable as a mass phenomenon, but may well be considered as a side note among Somm’s. 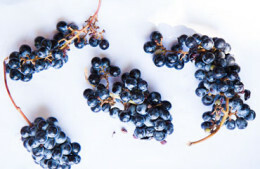 Vin naturel therefore is probably the most straightforward core statement of a vintage and the microclimate of a viticultural valuable parcel – a flavor addition for the destinguished tongue. Of course, unfiltered. Title: Auf der Insel habe ich immer nur gefunden. obligation to a higher demand – in 2004 Alexander Heer developed a project to reactivate old and lost European “vineyard treasures”. After a traditional winemakers apprenticeship, while studying oenology he defined his personal “mission Antique Viticulture”. The parameters for this were favourable. During his research as a technical writer for wine and food in a Publishers office in Wiesbaden, his attention was caught by an old book title. 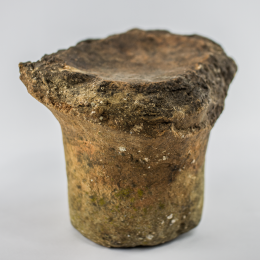 These culinary fragments of Roman publications stood out from the usual. The temptation was big to transfer this old identity of taste in his own vineyards. Nowadays he manages the vineyard areas in five European winegrowing regions. With the Rheingau and the Greek island of Thasos, Heer now links projects. He connects and defines the modern and the ancient to a new profile. In many places vineyards lie fallow nowadays, mostly by the lack of technical cultivation means. But it is these old steep vineyards considered to be the untouchables by modern man’s hand, which are being reactivated by him. But before he wants to discover “the vineyard” as such for their wines taste, he performs extensive soil analysis. The soils with the lowest amounts of former artificial fertilizer treatment, herbicide and pesticide contents are hereby the most important. Because in those the natural and unique flora and fauna has the best chances to return and to recolonize. The resulting wines reflect this followed maxim and manage to give birth to a wide diversity of species in the form of wine. In each of Heers small series, the characters and varieties of individual regions are found. Wine as a solid craft and cultural landscape protection – The generation of his interpretations of white and red wines are concluded as small series in stainless steel, oak and Kioupi. The wines produced under his hand are far away from the mass phenomenon of todays styles in winemaking, therefore not intended to please everyones gusto, but allowing the connoisseur who is looking for one or another variation, to see and taste old yet new nuances and aspects in wine. was not to capture clear at the beginning. We wade through temporary fragments such as thorny bushes, collapsed dry stone walls and decades of old roots. 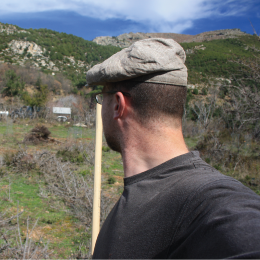 Several expeditions over two years are needed to provide viticultural structures Boula’s Vineyard again in a time frame of two weeks. We do not know why we pick and choose this particular place in the Aegean, but precisely here we find autochthonous vines and taste the history as salt on our lips. Labour that then in 2013 also optically payed off. 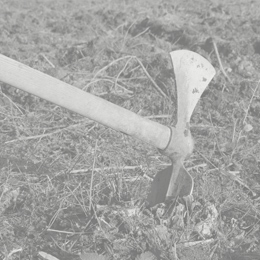 With a team of six companions, we transform our day’s work towards a tilth of a few hours. The interim fallow is plowed and harrowed. The rust-red hematite of the three terraces lies open in front our eyes. The soil gives off a difficult to describe hint of moisture, coolness and fungal nuances. We find ourselves there to only walk on tiptoe through the fresh field. With great respect we mark the rows for our grafted vines still on this day and close the new gate of our walled creation. A hard days work. Now it is time to plant the grafted Thasian vines quickly into the ground. We plant with a stick distance of 75 centimeters at a lanes width of 150 centimeters. “Tight planting” we call this technique, which is as old as the wine in these latitudes itself. With this we induce deeper rooting in the ground to get the precious liquids. We are motivated and the work goes off hand easier. The irrigation is installed. A new landscape is revealed. After thirty years the thermal updrafts of the day and the evening hours downdrafts blow freely across the majestic vastness of the three terraces. It is a grateful moment and we realize that we are part of this deprivation now. Staying as guests in a millennia of vineyards to Megalos Prinos. that we already brought to perfection in our 19° small series. The graphical transport of our wines is always a motivational factor. In wine series. the wine as a everage is always created first. The idea of ​​a label or brand is always only the result of many previous steps during production. We place the greatest possible attention to us not as artists, but to see much more than graphic. We work out the typography of the wine. 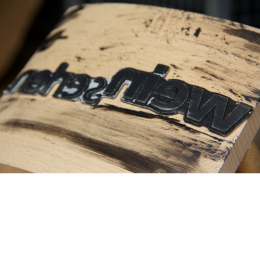 Screen printing – in this stencil printing method we opted for the use of iron filings in minimal grain. The challenge in this case is the area application of a viscous printing paste on the carrier material, for example cardboard. A0 is the format. The clay Greek pithoi the subject. As a limited edition of 50 units, we have now also conserved the graphic element of Amphora Germanica. The combined package of high-quality wine and creative commercial art is laced in all its haptic perception now.